Liverpool University Press has been publishing exceptional research since 1899, specialising in the modern languages, history, literature and visual culture. With Liverpool Scholarship Online (LSO), key works from this celebrated list are now available online for the first time. LSO has books in 8 subjects across the humanities and social sciences. What is the future of academic publishing? We’re celebrating University Press Week (8-14 November 2015) and Academic Book Week (9-16 November) with a series of blog posts on scholarly publishing from staff and partner presses. Today, we present selections from our partner Liverpool University Press. Which books have changed the world? While thoughts range from Karl Marx’s The Communist Manifesto (originally a political pamphlet) to George Orwell’s 1984 (a novel), great works of scholarship are often overlooked. However, it is these great works that can change our understanding of history, culture, and ourselves. Access to previously unseen historical documents has led to profound discoveries about the people and places that shape us today. Seemingly niche topics examined in depth have led to greater comprehension of the function of language (among other things). Indeed, even the form a published work takes can provide new dimensions and insight in a subject. Here are only five of the many titles from Liverpool University Press that have changed the world. Photo by Sara Levine for Oxford University Press. Liverpool University Press (LUP) is the UK’s third oldest university press, with a distinguished history of publishing exceptional research since 1899, including the work of Nobel prize winners. LUP has rapidly expanded in recent years to become an award-winning academic publisher that produces approximately 75 books a year and 25 journals, specialising in literature, modern languages, history and visual culture. 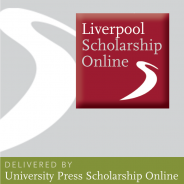 Liverpool University Press is distributed in North America by Oxford University Press USA and over 300 LUP books in eight subject areas across the humanities and social sciences can be found on Liverpool Scholarship Online.